PracticeLink.com W INTER 2018 65 Be the center of it all. Baptist Health continues to recruit the best physicians, providing the best care for the community. We have employed and non- employed opportunities available in the following specialties: Breast Surgery Cardiology Endocrinology Family Medicine Faculty Gastroenterology General Surgery Hematology / Oncology Internal Medicine Interventional Cardiology Maternal Fetal Medicine Neuro-surgery Neurology / Neuro-Intensivist OB / GYN Palliative Care Pediatrics Psychiatry Pulmonary / Critical Care Rheumatology Urology Vascular Surgery Contact Karen Ludick, Physician Recruitment Coordinator at (334) 273-4507 or kmludick@baptistfirst.org for more information about any of these specialties. Contact Nicole Nardi Director, Medical Staff Recruitment & Relations (570) 320-7696 or nnardi@susquehannahealth.org UPMC Susquehanna , formerly Susquehanna Health, is a growing, dynamic, and financially stable health system affiliated with Pittsburgh-based UPMC, serving north central Pennsylvania with a broad array of state-of-the-art care. Comprised of four hospitals, UPMC Susquehanna's multi-specialty group employs over 160 physicians in Lycoming, Clinton, and Tioga counties. 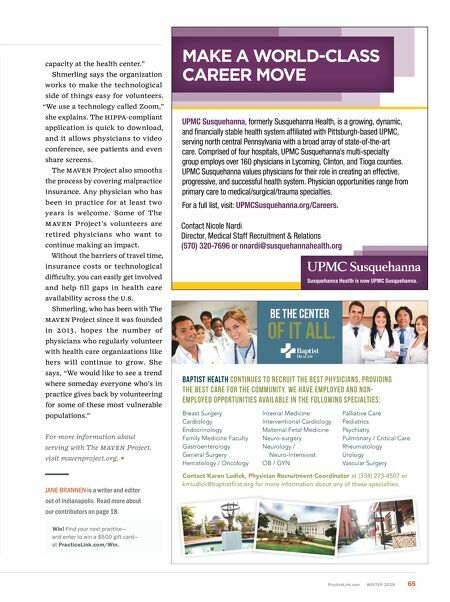 UPMC Susquehanna values physicians for their role in creating an effective, progressive, and successful health system. Physician opportunities range from primary care to medical/surgical/trauma specialties. For a full list, visit: UPMCSusquehanna.org/Careers. Susquehanna Health is now UPMC Susquehanna. Make a World-Class Career Move capacity at the health center." Shmerling says the organization works to make the technological side of things easy for volunteers. "We use a technology called Zoom," she explains. The h IPPA-compliant application is quick to download, and it allows physicians to video conference, see patients and even share screens. The MA ve N Project also smooths the process by covering malpractice insurance. Any physician who has been in practice for at least two years is welcome. Some of The M A v e N Project's volunteers are retired physicians who want to continue making an impact. Without the barriers of travel time, insurance costs or technological difficulty, you can easily get involved and help fill gaps in health care availability across the u .S. Shmerling, who has been with The MA ve N Project since it was founded in 2013 , hopes the number of physicians who regularly volunteer with health care organizations like hers will continue to grow. She says, "We would like to see a trend where someday everyone who's in practice gives back by volunteering for some of these most vulnerable populations." For more information about serving with The M av E n Project, visit mavenproject.org. JANE BRANNEN is a writer and editor out of Indianapolis. Read more about our contributors on page 18. Win! Find your next practice— and enter to win a $500 gift card— at PracticeLink.com/Win.